BeoVision 6 - 22 is an LCD 16:9 TV set introduced on 10 November 2003. It is fitted with a 51cm (diagonal) LCD screen which is coated similar to the Avant. 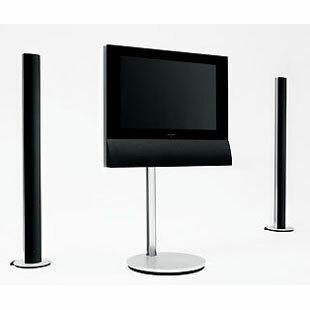 Active speakers are positioned at the base of the monitor, similar to the MX range of television sets. The rear of the unit is curved, similar to that of BeoSound 1. The unit is available in one colour only - Black - and is primarily designed for link-rooms: i.e. as an extra set for the kitchen or bedroom. BeoVision 6 - 22 may be fitted with a motorised base which turns the set and also regulates the inclination. 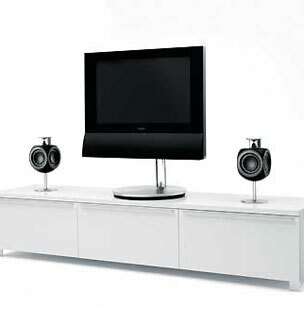 Standing possibilities include a low floor stand similar to BeoVision 5, wall bracket or a high floor stand high (as with BeoVision 1). This new LCD TV can be used as a PC monitor, too. When watching normal TV programmes, 'TV' on the Beo4 is selected; however, by combining the BeoVision 6 to your PC as a monitor via the rear-mounted DVI socket (see further details at BeoTech) and selecting 'PC' on the remote control, BeoVision 6 may be used in conjunction with your home computer. 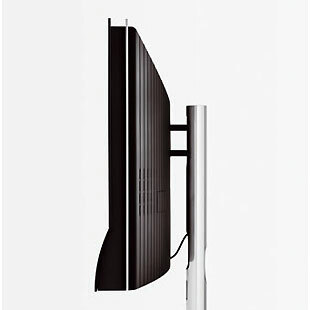 In 2004 BeoVision 6-26 was introduced to complement this 51cm model. Bang & Olufsen’s first LCD television is compact, simple and can be placed anywhere. And it also gives a sharp picture, no matter where you are in the room. A compact television that can be placed... well, where there isn’t any space. A television that can hang on the wall or stand on a chest of drawers, and that can be tilted and turned in all directions – that is the idea behind BeoVision 6 from Bang & Olufsen. 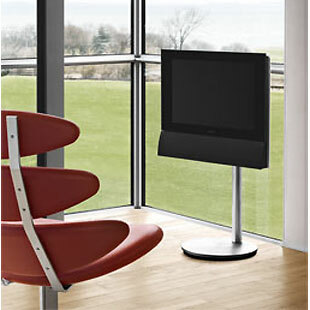 BeoVision 6 is the first television based on LCD technology offered by Bang & Olufsen. “Nevertheless, LCD technology has been extremely interesting to Bang & Olufsen ever since it came on the market, because it fits in perfectly with our philosophy of compact, simple and stylish televisions – televisions that don’t visually dominate the room you’ve put them in. But not until now has the technology been mature enough for both the image quality and durability to measure up to Bang & Olufsen’s standards,” says President and CEO Torben Ballegaard Sørensen. A range of technologies patented by Bang & Olufsen, such as Adaptive Black, Motion Adapted Progressive Scan and Digital Adaptive Luminance Peaking, put this LCD monitor in shape to deliver the image quality the company is known for. See the appendix “VisionClear”. One of the biggest problems of LCD technology has been the restricted viewing angle - in other words, the image is not visible if you look at the screen from an oblique angle. Although LCD technology has made considerable progress in this area, too, Bang & Olufsen’s engineers were still not satisfied. “Our ambition was to create a television that you could hang somewhere like the kitchen wall. And it would be no good if you could only enjoy it if you were seated at the dining table, and couldn’t see the picture if you stood at the worktop,” explains Sørensen. The solution was to equip the BeoVision 6 with a range of stands and wall fittings that make it easy both to turn the television from side to side and to tilt it up and down. The tilt function was a challenge to Bang & Olufsen’s developers. The first prototypes were either too clumsy and complicated or they were too difficult to operate. When the answer occurred one day to one of Bang & Olufsen’s engineers, it was so simple that it was difficult to understand why nobody had thought of it before. A design that allows the television to revolve around its own centre of gravity is both simple and discreet – and at the same time it makes it possible to tilt a television weighing 18 kilos at the push of a finger. The rear of the BeoVision 6 is curved. Visually, this makes it appear even flatter than it is in reality, and at the same time its curved shape makes it possible to turn the television through greater angles, both on and off the wall. It has always been Bang & Olufsen’s philosophy that the sound is half the experience of a television. For this reason, equal effort has been put into sound and picture in the BeoVision 6. The slightly slanting sound panel under the screen contains two 7,5cm bass reflector speakers and an ingeniously designed bass port. This integrated speaker system gives BeoVision 6 what it takes to deliver a stereo sound that surprises most people! Bang & Olufsen brings together objective parameters of image quality with subjective elements of viewing comfort into a combined whole, in which the perceived image is unsurpassed. At Bang & Olufsen, the designation VisionClear means that image quality and viewing comfort are inseparable. The exceptionally high image quality is achieved by elements such as Motion Adaptive Progressive Scan, Adaptive Luminance Peaking, Colour Transient Improvement (CTI) and Adaptive Black. The further development of Bang & Olufsen’s own Adaptive Luminance Peaking system increases the image quality further by reinforcing powerful fields of light in relation to the change in light signal present in the image. This function strengthens large light shifts proportionally less than small ones, resulting in amore uniform visual experience. The Colour Transient Improvement used in BeoVision 6 also ensures a high degree of dimensional precision. The correct level of black is ensured through the use of advanced Adaptive Black hardware. The right colour setting is obtained by allowing BeoVision 6 to adjust the light automatically while the television is in use. The electronics “read” the image on the screen and automatically increase the colours if the image is very pale, while the technology prevents black details from gradually turning grey during image shift. By focusing on a number of elements, viewing comfort – which involves an interplay between screen, user and surroundings – is accorded a high priority. Automatic image control sensors meter the background light in the room where the television is located, and ensure the best possible image at all light levels. A special anti-reflection-treated contrast screen also reduces the effect of external light incidence by over 80%. The result is that the contrast is markedly improved, which in turn provides a richer screen colour experience. Elements such as Hollywood-like electronic curtains, that open and close automatically, and Active Image Format Optimisation (in which the current screen image is automatically scanned and the best image format then presented on the screen) are included to add extra dimensions to the viewing experience. BeoVision 6 also uses digital noise reduction to decrease the noise in the image. The tilt table mount was available for counter top mounting, designed to allow the bass port on the underside of the TV to 'breath'. Motorised floor and table stands were complimented by a wall mount bracket which gave manual tilt and turn. Bang & Olufsen's preferred supplier for brackets and stands, STBbrackets, have made a range of solutions specifically for this model including a direct replacement for the tilt table mount. Distributed throughout the World by the Bang & Olufsen store network, the STB options add to the diversity of mounting options and positions available.